Fall is definitely in full swing here in Helsinki! I’m more and more often waking up to rainy mornings or walking back home in the evening while the rain is “washing up” the city’s streets. As much as I love my sunshine and relaxing time by the beach, I also love the feeling of freshness and new beginning that the Fall brings. I don’t know how or why but I suddenly feel so much more creative, focused and find it easy to take on any work task. How about you my readers? Do you like Fall and why? I’m behind with some home chores and will try to get them ready before a business meeting that I have this afternoon and then I’m off to work at the restaurant. Tomorrow will be a crazy working day for me but I’m very excited about it and thankful for every opportunity that I get. I’ll keep you all posted via my Instagram, so make sure to follow me over there! I like the fall clothes but not the weather. I have got the feeling that there is much more time when the sun is gone. I think its because in the summer i find myself reading in the garden in the sun more. I like your coat . i have seen a great tartan skirt by Alexander Mcqueen! Thank you Nancy! Oh, McQueen always have amazing tartan pieces! Fotka s maramom je čista <3… napisala sam ti na Instagramu! Podsjećaš me na Isadoru Duncan koja je često maramu nosila na taj način… p r e k r a s n a! Ne znam kako da ti se zahvalim na svim predivnim rijecima i komplimentima… Stvarno me uvijek ostavis bez teksta i ulijepsas mi dan! You remind me a lot of Alexa Chung! I really love this look. The coat is spectacular! Thank you Katie! This is a great compliment to me! You are always the epitome of chic! 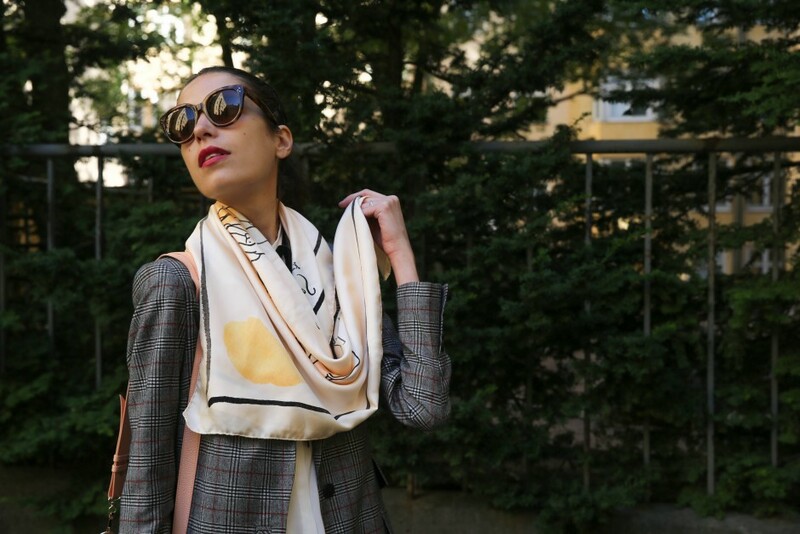 This scarf with your blazer is the perfect combination. Hope you make it through your busy day! Oh wow, what a nice compliment! Thank you Amy! 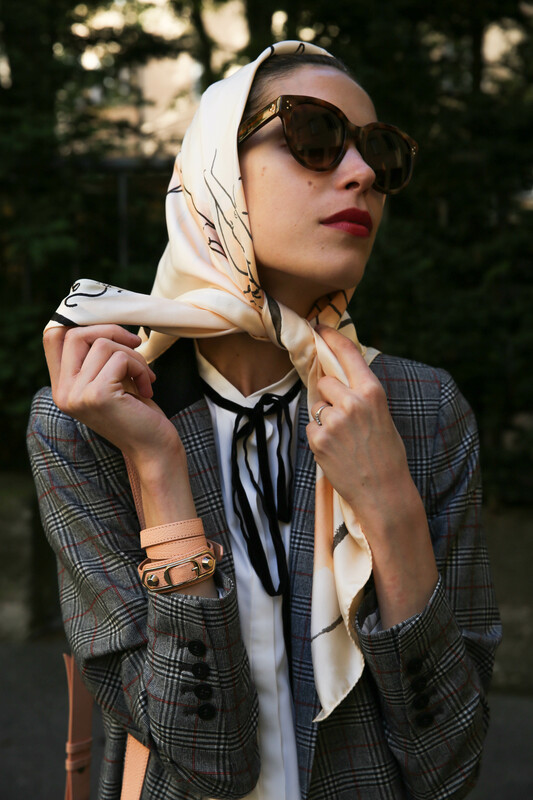 I love this look so much… makes me excited to collect some great scarves this season! Hi! Wonderful look! Is your sunglasses audrey model? If so,are they those oversized audrey sunglasses? Or the mini(?) audrey? Thanks! Love this outfit on you! 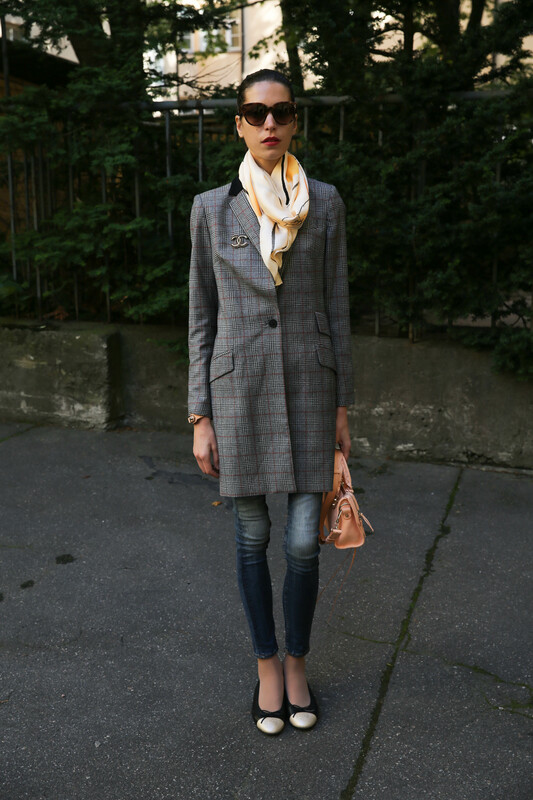 That scarf gives a special touch to this look! so chic, the blush pale color of your balenciaga and tweedy houndstooth long jacket with jeans. Euro chic. 🙂 I Imagine dressing smart like that in the fall. Kisses to you Natali. Have a great day, dear. Yes, it’s always a special feeling when you can shop at the designer’s own shop. Kisses to you as well Kate! So timeless! Very Jackie O! Oh wow! Thank you Vanessa! I adore this outfit! You look elegant and sophisticated. That scarf is perfect!! Thank you Diana! I like this scarf a lot too! You look so chic and elegant <3 Love it! 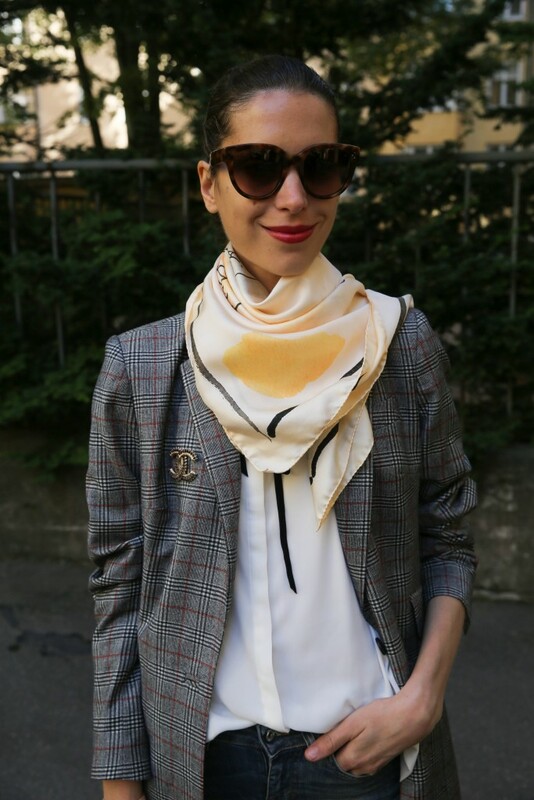 The Chanel scarf stole my heart! Thank you sweetie, glad that you liked the outfit! Love the coat! Amazing styling as always. This is a perfect combo!! beautiful pics!!! and you are very nice!! Super cute look. Love the coat. I love your style! Classy and sophisticated! You are so chic. I love the scarf! you look SO pretty! love the outfit, it is so classy! Thank you very much on this sweet comment! Najveca šlihtara i uvlakuša među blogerkama. Je l ti Zorana nekad napisala nešto na blogu, ili Portable Package.Ideš samo tamo gdje su novci,a sama znaš kakva si bila sirotinja i sad glumiš nešto. Gadiš mi se.A da Tamara čiji je otac klao tvoj narod ti je čak like pejđ.Služiš za podmijeh,nik te ozbiljno ne shvaća,svi znaju da si se udala za novce. Nemaš fakultet nemaš niš, što ćeš kad te Mika zameni mladjom,a več ima nešto se.Kome ćeš se apelat. Love your coat and shoes!! You look fantastic!!! You look amazing in this outfit! That little bag is soooo cute! 🙂 I checked out your IG and followed you there.